A Distill Creative craft party is the perfect option for a casual get together or special event. This package includes a structured, hands-on workshop where guests will learn basic techniques and complete a craft project. We’ve developed these workshops to be fun and easy for all skill levels. Distill Creative parties can come to you or we can host in our studio in Dumbo, Brooklyn, NYC. We serve the New York Metro area, Washington, DC metro area, or Southern California. Our workshops are typically two hours, but we can modify them to work for your party or event. We can also create a make and take version for larger events. Private Party Packages start at $500 for up to 10 attendees. Pricing is dependent on type of craft, size of party, location, length of party, and any additional services added. Shibori dyeing is a great craft party option for a small to medium-sized party and super fun to do outside or on a roof deck. For this experience, we need access to water, a place to dump dye, table and chairs, and a place to hang projects to dry. Our block printing party is a good option for any special occasion as guests are able to be as crazy or simple as they want and still create something special. You can choose from printing on paper or greeting cards or tote bags. For this experience, we need a sink to rinse off our printing plates when the event is over. Paper flower crowns are celebratory and fun for all ages. 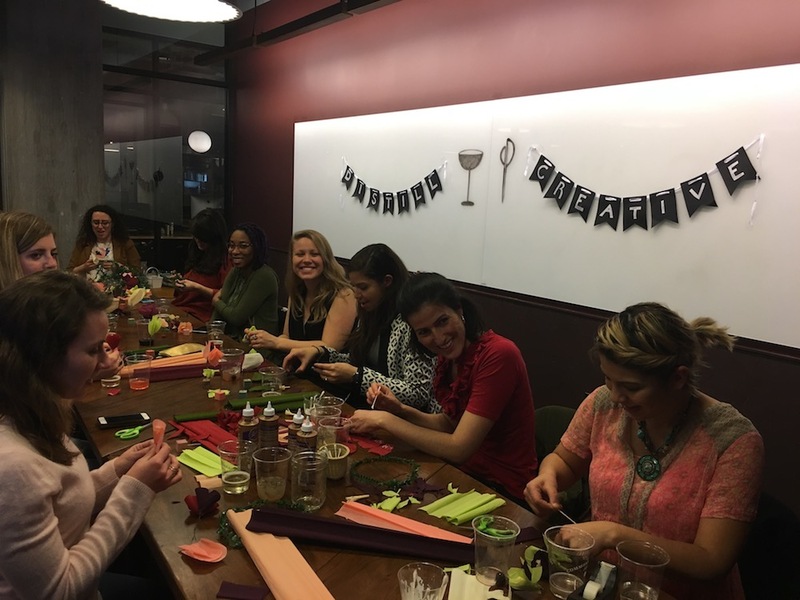 They are an especially good craft for bachelorette parties, bridal showers, mother’s day celebrations, girls night in, and retail pop-ups. They are a low-mess craft and can be set up in a variety of settings. Macramé is one of our favorite crafts and we love doing this with groups. This is a good craft if you are looking to slow down and chillax. You’ll quickly get into the zone and maybe even find this meditative. This craft option is best for groups of people who already know each other, because once you start making knots, you’ll get really focused and you might not want to chit chat too much. You can create a macramé plant hanger, wall hanging, or keychain, depending on how much time you have.